The all-new platform has allowed Ford's engineers to slash up to 88 kilograms (194 pounds). [UPDATE, April 25] Live images from the Beijing Motor Show have been added at the beginning of the gallery, below. Car sales are suffering under the weight of crossovers, but that doesn’t mean automakers are giving up just yet. Ford’s compact offering, the Focus, is all-new for 2019, and loaded with technology. A new design inside and out, along with improved interior materials will certainly usher new buyers into the segment. Ford unveiled the new Focus in Germany for the European market, with the U.S. expected to get the model imported from China from the second half of 2019. The Focus will ride on Ford’s new C2 platform, which improves interior space, crash performance, and aerodynamics for better fuel economy. The wheelbase grows by two inches (53 millimeters) helping to increase cabin space while shortening front and rear overhangs. Torsional rigidity is improved by 20 percent over the previous-gen Focus. The new Focus even takes cues from the RS, using the same extruded foam in the rear underbody cavity. More than just a pretty face, the Focus’ sleeker body was thoroughly optimized to improve aerodynamics and Ford has managed to lower the drag coefficient to 0.250 for the sedan and 0.273 for the hatchback. These are best-in-class figures, which corroborated with a weight loss of up to 194 pounds (88 kilograms), have helped slash fuel consumption and CO2 emissions by 10 percent. Ford piles on the technology with adaptive cruise control with stop and go, speed sign recognition, and lane centering that helps vehicles maintain a comfortable driving distance from the vehicles ahead. The Focus also receives improved lighting with Ford’s adaptive front lighting system with predictive curve light and sigh-based lighting. The system allows for the lights to pre-adjust before reaching a curve, junction, or roundabout. Instead of solely relying on a driver’s steering inputs, the system uses a forward-facing camera to monitor lane markings up to 214 feet (65 meters) ahead of the car. Other technological goodies include a head-up display, improved active park assist that allows the driver to push a button and complete a parallel parking move before engaging park, park-out assist, and pre-collision pedestrian and cyclist detection. There’s blind-spot monitoring, cross-traffic alert, rearview camera, post-crash braking assit, wrong way alert, and evasive steering assist, which provides steering support to help drivers maneuver around a vehicle if a crash is possible. FordPass Connect allows owners to perform a variety of vehicle functions right from their smartphone, such as locating the vehicle, check vehicle status including oil life, fuel levels, and more, lock and unlock doors, and initiate remote start for automatic-equipped Focus vehicles. Inside, there’s wireless charging, and an eight-inch color touchscreen for the infotainment system. The Focus uses Ford’s Sync 3 system that is compatible with both Android Auto and Apple CarPlay. Voice commands are available for a variety of functions that include audio control, climate functions, and navigation. There’s an available B&O Play sound system featuring a 675-watt, 10-speaker sound system with a subwoofer. In Europe, the Focus will have two gasoline engines choices that provide several different power outputs. There is a 1.0-liter EcoBoost making 84 horsepower, 99 hp and 123 hp, and a new 1.5-liter EcoBoost engine making 148 hp and 180 hp. A six-speed manual or a new eight-speed automatic are the only two transmission choices available. The bigger unit has cylinder deactivation tech and it will turn off one of the cylinders in 14 milliseconds or 20 times quicker than the blink of an eye. On the diesel side, there are new EcoBlue units with 1.5- and 2.0-liter displacements. The former will be offered in two states of tune: 94 hp and 118 hp, with both delivering 221 lb-ft (300 Nm) of torque. Go for the bigger diesel and Ford will reward you with 148 hp and 273 lb-ft (370 Nm). For the first time ever in a diesel-powered model from the Blue Oval, the 2.0-liter mill uses steel pistons. 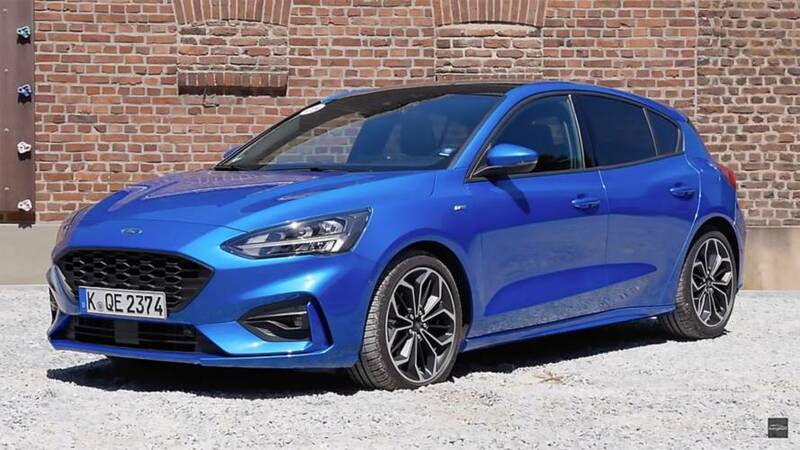 While Europe will receive the Focus sedan, wagon, and hatch, along with Focus Active crossover and upscale Focus Vignale, the U.S. market will receive the sedan and hatch along with future iterations of the ST and RS. COLOGNE, Germany, April 10, 2018 – Ford today delivered the global public debut of the all-new Ford Focus, the most accomplished and technically-competent Focus ever. Following closer collaboration with customers than ever before, the all-new Focus has been developed from the ground up to provide the most confidence-inspiring, intuitive, and rewarding driving and occupant experience of any mid-size family car in Europe. Focus introduces a new human-centric design philosophy that fuses emotional exterior styling with class-leading aerodynamics; and delivers an interior offering more space combined with high quality materials and craftsmanship. The all-new Focus remains true to the nameplate’s 20-year legacy of class-leading driving dynamics, further enhanced with the first Focus-application of Continuously Controlled Damping (CCD) technology for the independent front and rear suspension systems; new Drive Modes; an isolated rear subframe for greater refinement; and Ford-patented spring technology. The occupant experience is enhanced with comfort and convenience features including FordPass Connect embedded modem for connectivity on the move and a new Wireless charging pad for compatible smartphone devices. Powertrain options include a further optimised version of Ford’s multi-award-winning 1.0-litre EcoBoost and new 1.5-litre EcoBoost petrol engine, both enhanced with Ford’s industry-first cylinder deactivation application for three-cylinder engines. New 1.5-litre EcoBlue and 2.0-litre EcoBlue diesel engines deliver ultimate fuel-efficiency, and a new intelligent eight-speed automatic transmission adapts shift patterns to driving style, and is controlled using a stylish and ergonomic Rotary Gear Shift Dial. Unveiled in five-door hatchback, wagon and in selected markets four-door body styles, the most comprehensive Focus line-up ever is offered with exclusive personalities to complement the broadest spectrum of mid-sized car customer aspirations, including the stylish Focus Trend and Titanium, sporty Focus ST-Line, upscale Focus Vignale and the first Focus Active crossover. The all-new Focus is the first vehicle globally to be based on Ford’s new C2 platform designed to enhance crash performance; deliver more interior space for Ford’s mid-size models without negatively impacting exterior dimensions; and support improved aerodynamics for better fuel-efficiency. Best-ever craftsmanship and quality is delivered following a €600 million investment at Ford’s Saarlouis assembly facility, Germany. Ford has sold almost seven million Focus cars in Europe* and more than 16 million around the world since the game-changing first generation Focus was introduced in 1998. The all-new Ford Focus marks an evolution in Ford design language. Created to deliver rich user experiences with every interaction, the “human-centric” design philosophy unites expressive form language with functional, customer-driven attributes. Focus has matured proportionally, to reflect a more premium, sporting silhouette while offering increased comfort and roominess. The distinctive new silhouette is achieved principally through positioning the A-pillars further rearward; a balanced proportion that allows them to aim towards the centre of the front wheel while the muscular sheet metal of the C-pillars sits squarely over the rear wheels. The resulting longer hood and flowing front fender, coupled to a marked reduction in the wedge of the beltline, is both powerful and elegant, enhancing the car’s premium and sporting character. Extending the wheelbase by 53 millimetres enables a larger tyre diameter, allowing the wheels to be positioned higher into the sheet metal and reducing the perception of length and visual mass. The shorter overhangs and rearward cabin position gives a strong, dynamic stance with a compact impression. Managing air flow around the vehicle played a pivotal role in the design development of the all-new Focus. A highly sculptural, athletic exterior delivers class-leading aerodynamic efficiency through the sleek, lower profile; the short rear overhangs; truncated corners; and harmoniously integrated aerodynamic features. Generous in movement, the sheet metal is formed through highly tensioned, athletic sculpturing. Wide surfaces catch the light to visually entertain from front to rear. The long front fenders project with conviction towards the squat rear haunches, creating a dynamic visual agility. The face of the all-new Focus is simple and harmonious, exuding a clear and assertive presence. A discernibly larger, yet recognisably proud Ford grille sits confidently between the horizontally-biased headlamps, which, like the taillamps, are placed as far outboard as possible to enhance width and stance. The taillamps are now two-piece, allowing for a more versatile deck-lid opening, while LED lighting technologies provide distinctly recognisable signatures in daylight and darkness. The Focus script is positioned proudly in individual satin-finished letters between the taillamps, reaffirming the premium execution at the rear. A palette of 13 exterior colours includes Orange Glow, Desert Island Blue and Vignale-exclusive four-coat Dark Mulberry. The human-centric design philosophy extends to the interior, which delivers a more inviting and accommodating environment with greater perceived quality – achieved using simple, clean lines, expressive and confidence-inspiring materials, and seamlessly integrated surfaces. Simplified, less cluttered design supports a more calming atmosphere. Front doors now flow fluidly behind the instrument panel for a visually spacious, upmarket, wrap-around effect. The upper instrument panel and door interiors are constructed from soft touch materials for a more premium feel. Sophisticated jewellery elements reflect contemporary high-end consumer product design, with polished glass and brushed finishes among those offered for the passenger-side instrument panel deco-spear, door trims and air-vent registers. As with the exterior, the interiors of the all-new Focus derivatives feature unique design elements and materials for a distinctive character, including fine-grain wood-effect finishes and premium leather for Vignale, sporty carbon fibre-effect finishes and red stitching for the ST-Line, and more rugged, textured materials and surfaces for the Active. The all-new Ford Focus introduces a wider range of advanced features than any Ford vehicle before, bringing technologies synonymous with Level 2 automation to a family car. ACC with Stop & Go, Speed Sign Recognition and Lane-Centring helps the vehicle maintain a comfortable driving distance from vehicles ahead; helps reduce stress during long road trips by helping keep the vehicle centred in its lane; and can adjust the vehicle speed to within legal limits by monitoring the roadside and overhead gantries for speed signs in addition to using information from the on-board navigation system. ACC works at speeds up to 200 km/h (125 mph). The new Stop & Go feature enables the ACC system to bring the vehicle to a complete halt in stop-start traffic using up to 50 per cent of total braking force, and automatically pull away if the stopping duration is less than 3 seconds. For stopping durations greater than 3 seconds, the driver can push a steering wheel button or gently apply the accelerator pull away. Lane Centring technology monitors road markings and can apply gentle but discernible torque to the steering system to help drivers stay centred in their lane whenever the ACC system is activated. Designed to support drivers at speeds up to 200 km/h (125 mph), the technology will deliver visual and audible warnings if it detects a lack of steering wheel input from the driver. “Think back to when you took your driving test, and how hard you had to concentrate to be safe on the road. Driving hasn’t become any less demanding – we just become more accustomed to pressure. Technologies like Stop & Go and Lane-Centring will reduce the demand on drivers, helping them focus their attention and be less stressed, and more confident, at the wheel,” said Helmut Reder, global vehicle line director C-car, Ford of Europe. Ford’s Adaptive Front Lighting System with Predictive curve light and Sign-based light for the first time pre-adjusts headlamp patterns for maximum visibility before reaching a curve, junction or roundabout. The all-new Focus lighting technologies including Adaptive Front Lighting System that adjusts the headlight beam angle and intensity to match the driving environment, and Glare-free high beam that removes the guilt of accidentally dazzling other drivers and helps users see more of the road ahead at night, are supported by advanced full-LED headlamps that use an innovative adjustable drum configuration for greater flexibility and softer, less distracting transitions. Focus is also the first Ford vehicle in Europe to offer a Head-up display (HUD), which helps drivers keep their eyes on the road by projecting useful information into their field of vision. The system maximises effectiveness with one of the largest fields of view of any HUD available in Europe, measuring 6 degrees by 2.5 degrees. The system is also amongst the brightest available, adjustable in 16 increments up to 10,000 candela per metre2. Special filters for the retractable polycarbonate screen make it the first of its type that can be read by users wearing polarised lenses. Depending on vehicle specification, the configurable selection of projected information includes speed – the only content that is always present; Traffic Sign Recognition; ACC; navigation; Shift Indicator; entertainment system; and emergency notifications. Active Park Assist 2 makes parking even easier: delivering fully-automated manoeuvres into parallel and perpendicular parking spaces at the push of a button. Enabled by the shift-by-wire capability of Ford’s new eight-speed automatic gearbox, the system identifies suitable parking spaces and the driver can control vehicle motion by simply selecting neutral and holding down a single centre console-mounted button. The vehicle then fully controls forward and reverse gear selection, throttle and braking, as well as steering – manoeuvring into spaces just 110 centimetres longer than the car and on gradients up to 12 per cent at speeds of up to 4 km/h (2.5 mph), before engaging park. The technology can also help driver exit parallel parking spaces using fully automated Park-out Assist. Also further enhanced, Ford’s Pre-Collision Assist with Pedestrian and Cyclist Detection technology can detect people in or near the road ahead, or who may cross the vehicle’s path. The system automatically applies the brakes if it detects a potential collision and the driver does not respond to warnings; can now also detect cyclists; and functions in the dark using light from the headlamps. Ford anticipates a five-star safety rating for the all-new Focus, supported by a 40 per cent increase in front crash load capability from the all-new C2 platform. A sophisticated all-new chassis complemented with advanced driving technologies delivers a class-leading, energetic, engaging and rewarding fun-to-drive experience for all-new Focus five-door and wagon customers, alongside greater refinement. The all-new Focus enhances the legacy established by the game-changing first generation model, with a new isolated subframe for the short long arm (SLA) independent rear suspension configuration that optimises both comfort and the vehicle’s responses to driver inputs. The SLA system delivers a desirable balance between front and rear compliance over larger bumps in the road, for smoother journeys. Multi-compound bushes feature different stiffness characteristics when stressed in different directions – separating the sub-frame from the body structure for better isolation of smaller bumps and improved noise, vibration and harshness. A unique SLA geometry for Focus wagon models repositions the dampers helping the vehicle remain agile and responsive even with a fully loaded boot, and helping maximise boot space with a wider load-floor area. A lightweight twist-beam rear suspension configuration is also offered; refined to deliver the distinctive character and driving dynamics customers expect from Focus. Enhanced using the same Ford-patented force vectoring spring technology that supports the responsive, engaging and fun-to-drive experience of the all-new Fiesta ST, the twist-beam configuration is designed to complement the lighter 1.0-litre EcoBoost and 1.5-litre EcoBlue powertrains. The advanced spring technology applies vectoring forces to the rear suspension, enabling cornering forces to travel directly into the spring for increased lateral stiffness, and improving stability, agility and responsiveness for an even more enjoyable driving experience. 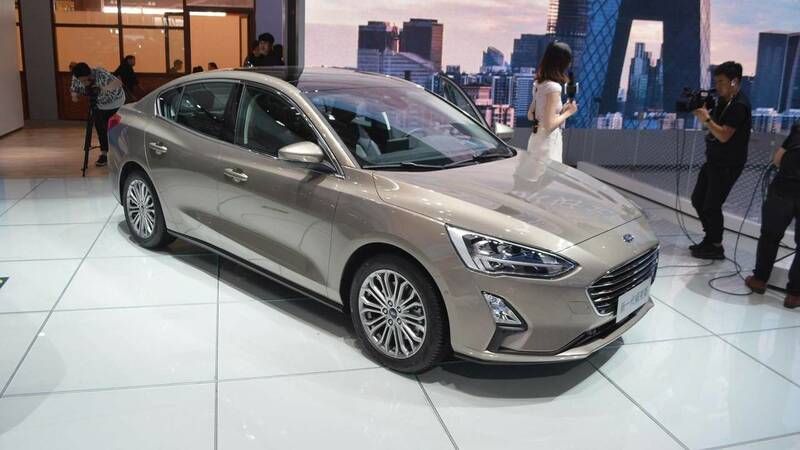 Refinement of five-door models equipped with SLA suspension is further enhanced with the first introduction of Ford’s CCD technology for Focus, which every 2 milliseconds monitors suspension, body, steering and braking inputs, and adjusts damping responses for outstanding ride quality. The technology also helps reduce the impact of driving through potholes, by detecting the edge of a pothole and adjusting the damper so that the wheel doesn’t fall as far into it. Because the tyre and wheel don’t drop as far, they don’t strike the opposite side of the pothole as harshly. The rear suspension can respond even faster, with a signal from the front wheel providing a pre-warning to the rear wheel well before it reaches the pothole. The CCD system also supports Drive Mode technology. Normal, Sport and Eco modes are offered for the first time on a Focus, enabling drivers to immediately adjust throttle pedal, eight-speed automatic gearbox, Electronic Power Assisted Steering (EPAS) and ACC characteristics to match the driving situation. When equipped with CCD, Focus also offers Comfort and Eco-Comfort Drive Modes, and will adjust the suspension character accordingly. A new column-mounted EPAS system and new software deliver an even more responsive, intuitive and engaging feel for a brilliantly rewarding driving experience, complemented by comfort-enhancing features including Torque Steer Compensation. Focus also debuts a bespoke, in-house developed Ford Stability Control system tailored to support Ford driving dynamics, and featuring Torque Vectoring Control. Braking distances from 100 km/h (62 mph) are reduced by up to 1 metre, supported by the new Electric Brake Booster for select models that builds pressure faster, and delivers a more confident and consistent pedal feel across a broader range of operating conditions. Focus is the first vehicle to be manufactured using Ford’s all-new C2 platform that – combined with an all-new body structure – enabled engineers to enhance stiffness for greater responsiveness. Torsional rigidity is improved by 20 per cent compared with the previous generation Focus, and the stiffness of individual suspension attachment points is increased by up to 50 per cent, reducing flex for better body control. The all-new Focus features an innovative method to increase the stiffness of the rear structure, developed for the acclaimed Ford Focus RS model. An extruded foam is inserted wet into a rear underbody cavity during the assembly process, which then dries and expands under the heat of the paint-drying process to deliver 10 per cent greater local lateral rigidity with minimal additional weight. From the 10 millimetre lower Focus ST-Line with unique springs, dampers and stabiliser bars, to the more than 30 millimetre raised Focus Active with unique front and rear knuckles, the chassis of every derivative has been tuned to deliver the immediately recognisable Focus character. Spacious, practical and well connected – the all-new Focus interior features innovative engineering and advanced comfort and convenience technologies that help the vehicle seamlessly integrate into customers’ lives. Devices can remain connected via Bluetooth to Ford’s SYNC 3 communications and entertainment system while using wireless charging. Supported by an 8-inch colour touchscreen that can be operated using pinch and swipe gestures, and compatible with Apple CarPlay and Android Auto™, SYNC 3 allows drivers to control audio, navigation and climate functions plus connected smartphones using simple voice commands. A new B&O PLAY sound system will help occupants get the best from music streamed via FordPass Connect or smartphone devices. The 675 watt system features ten speakers, including a 140 millimetre boot-mounted subwoofer and a mid-range speaker in the centre of the dashboard, and has been specifically calibrated for the Focus five-door and wagon body styles for one of the best audio experiences of any vehicle, let alone a mid-sized hatchback. Comfort is key to the more refined and upscale all-new Focus occupant experience. Front seat occupants will enjoy generous shoulder room of 1,421 millimetres, and instrument panel positioning is optimised for greater space. An electric parking brake – standard with eight-speed automatic transmission and for high series models with manual transmission – and Rotary Gear Shift Dial also free up more space for the driver and front passenger. A narrower centre console – enabled by relocating switches and controls to the touchscreen – features soft knee pads for more comfort. For rear seat passengers, additional space is delivered by the longer wheelbase and flat floor. Knee clearance is improved by more than 50 millimetres compared with the outgoing Focus, for a best-in-class 81 millimetres. Shoulder-room is increased by almost 60 millimetres compared with the outgoing Focus. The impression of spaciousness is enhanced with a rear door design featuring windows that stretch into the rear pillar for a more open sensation, and an available openable panoramic roof. Developed specifically for the new C2 platform, the Focus heating ventilation and air-conditioning system heats and cools the cabin faster with a more powerful 140 cc compressor, and features more flexible coolant lines and smoother airflow paths for quieter operation. Focus even features special shaping for the door mirrors, designed to help mitigate the buffeting throb effect that can occur when one window is lowered at speed – good news for dog owners. Speaking of dog owners, there is more good news for them: the wagon boot space is designed to comfortably accommodate a dog crate, with load height increased by 43 millimetres; length to the rear seat increased by 25 millimetres; and – with the rear seats folded via the pull of a switch using the new Easy Fold Seats feature – length to the front seats increased by 175 millimetres for more than 1,650-litre capacity. Ford’s Hands-free tailgate technology allows access to the wagon boot space with a simple kicking motion under the rear bumper, and engineers have delivered a solution to the challenge of where to place the tonneau cover once removed: it now fits neatly beneath the new flexible load floor, and is easier to remove with a simple pull-strap release. 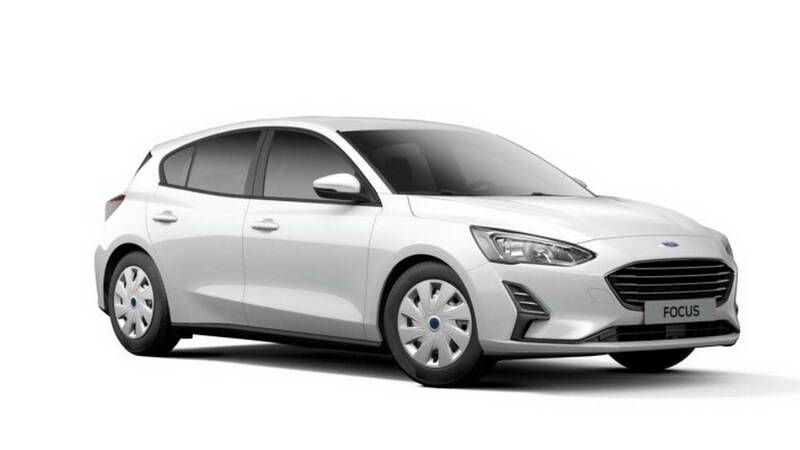 All-new Focus customers can choose from an advanced range of Ford EcoBoost petrol and Ford EcoBlue diesel engines delivering optimised power and refinement; and meeting the latest stringent Euro 6 emissions standards calculated using the World Harmonised Light Vehicle Test Procedure (WLTP). Powertrains are supported by standard Auto Start-Stop for reduced running costs; and slick-shifting six-speed manual and new eight-speed automatic transmissions for effortless cruising. Ford’s multi-award-winning 1.0-litre EcoBoost is offered with 85 PS, 100 PS and 125 PS, and new 1.5-litre EcoBoost engine is offered with 150 PS and 182 PS. Fuel-efficiency and CO2 emissions from both EcoBoost petrol engines are enhanced using Ford’s industry-first cylinder deactivation system for a three-cylinder engine, which can automatically stop one of the engine’s cylinders when full capacity is not needed, such as when coasting or cruising with light demand on the engine. The technology can disengage or re-engage one cylinder in 14 milliseconds – 20 times faster than the blink of an eye – with no compromise in performance or refinement. Core EcoBoost technologies including advanced turbocharging, high-pressure direct fuel injection and Twin-independent Variable Cam Timing, also feature for both engines. Particulate emissions are reduced using standard gas particulate filter technology. Ford’s advanced new turbocharged EcoBlue diesel engines are designed to deliver higher power, more torque at low rpm, and enhanced fuel-efficiency and refinement for higher-mileage drivers. The new 1.5-litre EcoBlue is offered with 95 PS and 120 PS both delivering 300 Nm of torque, and with CO2 emissions from an anticipated 91 g/km for the five-door model. The 2.0‑litre EcoBlue engine delivers 150 PS, 370 Nm of torque, and CO2 emissions from an anticipated 112 g/km for the five-door model. Ford’s latest six-speed manual transmissions also enhance the driving experience with improved shift quality; reduced gear whine and rattle; and a low-friction architectures that feature low-viscosity oils, friction-optimised bearings and in some cases Teflon bushings. Fuel-efficiency is further improved by weight-reductions of up to 88 kilogrammes like-for-like, compared with the outgoing Focus. Even the brake architecture is enhanced to benefit fuel-efficiency: the faster response of the Electric Brake Booster allows more clearance between the brake pads and disc for less drag. The all-new Ford Focus is manufactured using industry-first processes at Ford’s Saarlouis assembly facility, Germany – delivering best-ever Focus quality and craftsmanship. A new 6,000 metre2 hot-forming facility enables ultra-high-strength, lightweight boron steel components to be manufactured on-site, and is the first hot-forming production line in the industry to feature fully automated unloading for optimised efficiency. Forty-metre furnaces use gas and magnetic induction to heat boron steel plates to 930 degrees C, making them pliable enough to be moulded by 1,250 tonne presses. The water-cooled plates are then precisely cut into their final shape inside special cells each containing a laser that slices through the boron steel with a 3,000 degrees C beam. An advanced new form and pierce process improves fit and finish of the entire Focus front end by using cameras to measure the optimal location for the position of mounting holes, within tolerances of 0.1 millimetres. To ensure ultimate precision, a second camera system monitors the position of the apparatus and can adjust to tolerances of 0.1 millimetres to account for expansion and contraction in changing temperatures. The process enables mounting holes to be positioned with 0.5 millimetre accuracy. The first Ford-application of a new laser-welding technology operates with greater speed, flexibility and efficiency, and is capable of delivering wobble-welded seams for more strength. Also introduced is advanced tri-focal laser-brazing – the fastest at Ford with an operating speed of 60 millimetres per second – for cleaner, stronger and more precise joints between roof and body side.